KOOTENAY ANNOUNCES ALL SEVEN DRILL | Kootenay Silver Inc.
Kootenay Silver Inc. (TSXV: KTN) (the “Company” or “Kootenay”) is pleased to announce results from the seven remaining drill holes of its 3000 meter, phase I exploration drill program on mineralized targets proximal to its La Cigarra silver deposit in Chihuahua State, Mexico. 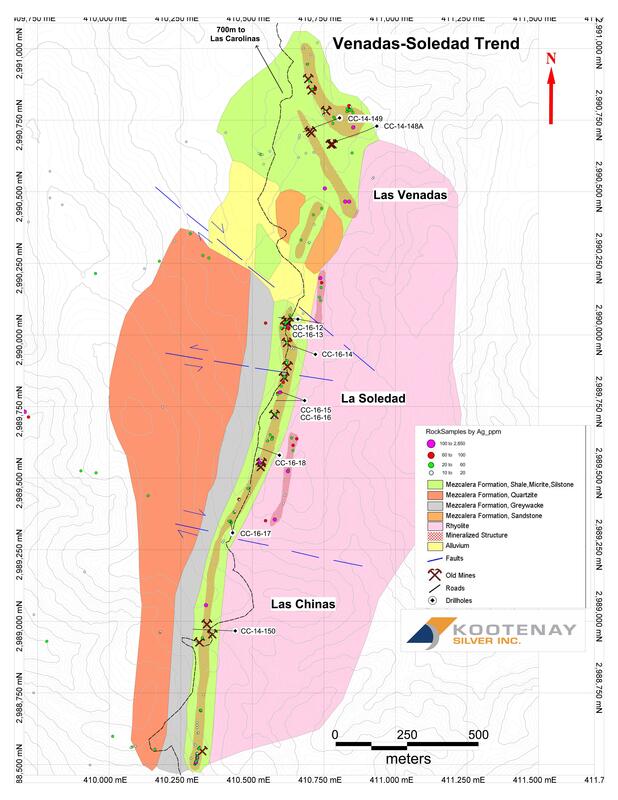 The holes tested a 700-meter strike length of the La Soledad structure, which extends southward along strike from the La Cigarra silver deposit for a distance of approximately 2 kilometers. All seven holes intercepted significant widths of veining and varying grades of silver mineralization confirming the presence of a large mineralized structure. Click to view: La Soledad Drill Plan. The 18 hole drill program totaling 3000 meters is the first stage of a multi-phase program evaluating several high priority targets identified proximal to the La Cigarra silver deposit with the potential to add near surface silver resources to the La Cigarra project. The first 11 holes of the Program completed by the Company resulted in a new silver discovery within a 400-meter long strike length on the RAM structure, (see Kootenay news release dated November 23, 2016). Follow up drilling on both the 3.8 kilometer RAM and 2.0 kilometer Soledad structures remain a priority for the Company, as does the drilling of known underlying high-grade mineral extensions on the La Cigarra silver deposit. At the present time, Kootenay’s technical team is nearing the completion of a comprehensive exploration program that includes detailed mapping, sampling and re-logging of previous drill core related to the La Cigarra silver deposit. This work is being conducted in order to gain a better understanding of what controls the high silver grade within the La Cigarra deposit. In addition, the work will assist the Company in the design of a future drill program focused on the expansion of the silver resource, which is anticipated to begin within the first quarter of 2017. Kootenay is also planning on conducting further metallurgical testing to assess the use of the SILVOX leach process as a viable low-cost option for development of oxide and sulfide resources of its La Cigarra silver deposit. For details of the Company’s preliminary metallurgical results using the SILVOX proprietary leaching process (see Kootenay news release dated January 22, 2017). The technical information in this news release has been prepared in accordance with the Canadian regulatory requirements set out in National Instrument 43-101 (Standards of Disclosure for Mineral Projects) and reviewed on behalf Kootenay by James McDonald, P.Geo, President, CEO & Director for Kootenay, a Qualified Person. The information in this news release has been prepared as at February 1, 2017. Certain statements in this news release, referred to herein as "forward-looking statements", constitute "forward-looking statements" under the provisions of Canadian provincial securities laws. These statements can be identified by the use of words such as "expected", "may", "will" or similar terms.